This pen, the Pilot HiTec V5 cartridge pen, showed up at our local pen store recently. I’m a fountain pen guy and wouldn’t have even noticed it if not for the display right next to it that held Pilot fountain pen cartridges. For those who like nylon/felt-tip pens for sketching, but who also would like access to the range of colors available to fountain pen folk, may want to give this pen a try. It’s available with either a .5 mm or .7 mm tip. I bought the .5 mm and its line does compare to a Sakura Micron 05. The ink density and color is similar too but with one very large difference. Pilot inks are not waterproof. This can be good or bad depending on what you’re going to do with the pen. It made no difference to me as I bought it with the thought of seeing if I could use it with other inks, specifically, Noodler’s Lexington Gray which is my main sketching ink. I emptied the cartridge and used an ear syringe to pressure a bunch of water through the feed/point to clean out the ink contained within. This is a slightly bigger job than it would be with a fountain pen as the feed on these pens seems to hold a lot more ink. Nevertheless, it only took a minute of two. I filled the cartridge with Lexington Gray and once attached to the pen I squeezed the heck out of the cartridge to pump ink into the feed/point. 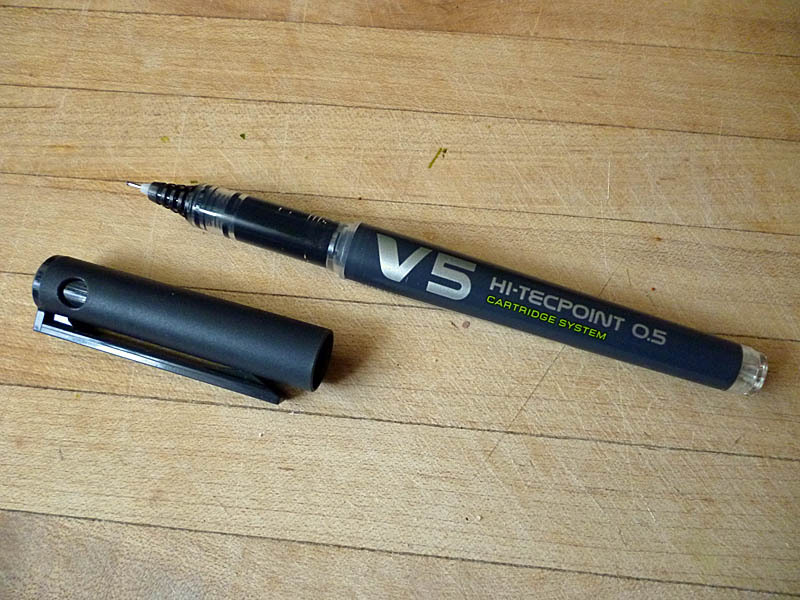 This would be easier if one were to use a Con-50 converter, which has a plunger that would pressure ink into the pen. 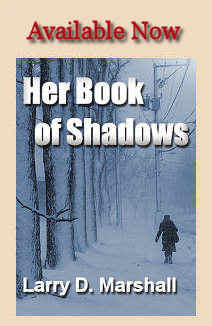 Nevertheless, in another minute or so I had Lex Gray coming out of the pen. Refilling, of course, is quick as I just pull the cartridge and use a pen syringe to refill it. My concern was that the pen would dry/plug up so I waited to write this until I’d had the Lex Gray in the pen for a week or so. 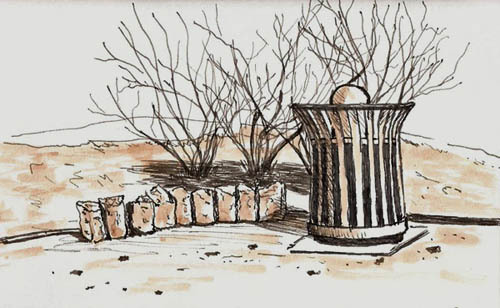 While walking through a local park, I made this little sketch of one of my favorite subjects, a park trashcan. 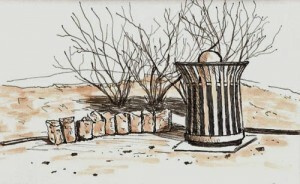 Done in a Stillman & Birn Alpha (4×6),I was impressed by how the pen performed.